The last time I visited Great Swamp National Wildlife Refuge in Basking Ridge, NJ, mere days after I started this site, I stated that tales of the swamp’s greatness were somewhat exaggerated. I’ve just been again, and the verdict is improving, but still not quite great. Perhaps the swamp isn’t entirely to blame. After all, I just came off a few days of East Bay birding with scads of special California species to chase those end-of-winter birding blues away. The gray day and chilling rain didn’t present ideal conditions either. After the red-eye that brought me home Friday night and the Mason-manufactured disruptions of Saturday’s slumber, I wasn’t exactly in the mood for March madness, which in this context is the insanity of birding when the specialists of one season have flown but the next shift hasn’t yet arrived. But, cranky as I was, I was happy to revisit the Great Swamp as it’s been too long since I’ve been birding with Charlie. 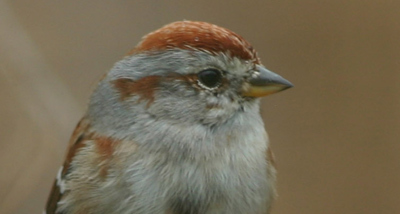 The first species to greet us at the Great Swamp, not coincidentally the most common bird of the day, was American Tree Sparrow. Juncos were still making the scene, but White-throated Sparrow numbers seem to have declined considerably. 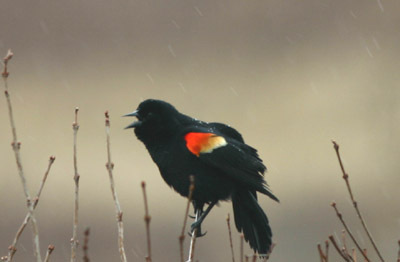 The trees were also laced with Song Sparrow, Black-capped Chickadee, Tufted Titmouse, White-breasted Nuthatch, Mourning Dove, and Red-winged Blackbird. Both Downy and Red-bellied Woodpeckers were abundant; although I saw only one Northern Flicker, that gave me sightings of both the red-shafted and yellow-shafted subspecies within the space of a few days. The waterfowl were predominantly the usual Mallard, American Black Duck, and Canada Goose, though the number of Wood Duck pairs were impressive. Besides those and the odd Great Blue Heron or Common Grackle, the Great Swamp just wasn’t so hot. No rails, no Swamp Sparrows, no surprises at all, but that’s just fine, since I was there for the company anyway.